Regarding Sunday's Brickyard 400 at Indianapolis Motor Speedway Martin Truex Jr. has feelings ranging from optimism to trepidation. For the optimism part, Indy's 2.5-mile flat track has similarities to Pocono Raceway where Truex claimed a victory last month, driving the No. 78 Furniture Row/Denver Mattress Chevrolet. The apprehension is a result of NASCAR's new aerodynamic rules package for the fabled track. 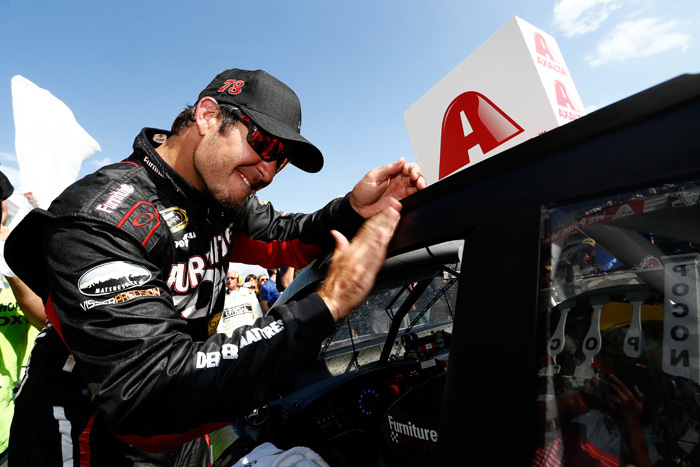 "Indy is a super challenging and technical racetrack," said Truex. "However, after winning at Pocono I feel like we'll have a little bit of an edge there because of some of the similarities between the two tracks. I feel that we can apply a lot of things we did at Pocono to Indy. Lots of people tell me, "I don't even watch the races anymore," or, "I just watch the last 30 minutes." I never thought, back in the early 1990s, when I started making most of a living writing about stock car races, that what people said about NASCAR would ever be what, at the time, they were saying about the NBA. I guess part of it is that people have changed to the point where they'd rather watch their phone than their television set. One reason folks think the racing is boring is that they don't really watch it anymore. Sometimes in racing, it's better to be lucky than good. Kyle Busch was both lucky and good in Sunday's 5 Hour Energy 301 at New Hampshire Motor Speedway on his way to the checkered flag. 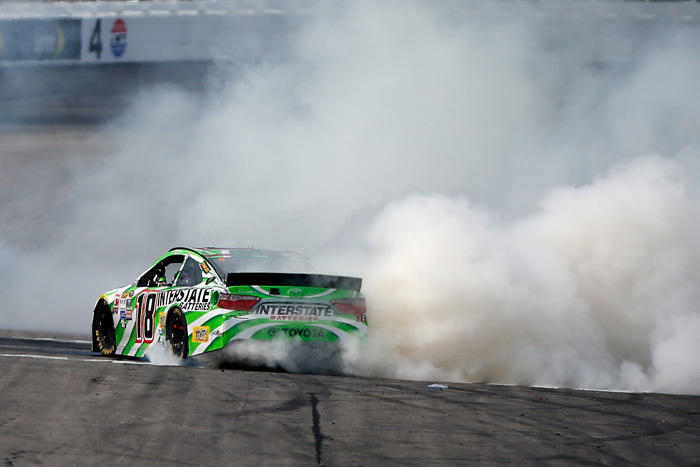 Busch led 96 laps on the way to his third victory in the last four races. The three victories for Busch now places him just 58 points out of top 30 in the Sprint Cup points standings; his final obstacle in gaining Chase eligibility. Busch believes this may be one of the most special seasons of his career with his success despite trying circumstances. Denny Hamlin didn't slam his Joe Gibbs Racing teammate Kyle Busch. Hamlin didn't bump Austin Dillon after a late race restart either. Hamlin did; however, rub fenders with both of them and in the immortal words of fictional movie character Cole Trickle's crew chief Harry Hogge, 'Rubbing, son, is racing." Hamlin was able to rub and nudge his way to the checkered flag in Saturday's Lakes Region 200 from New Hampshire Motor Speedway. 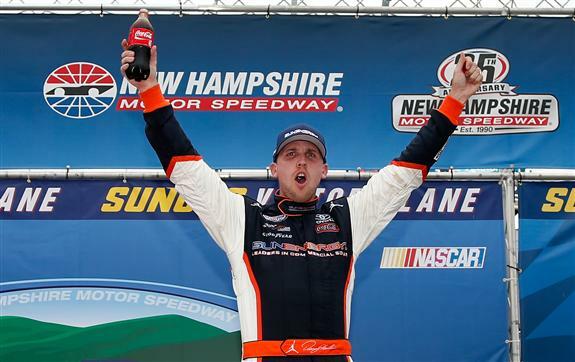 The win is Hamlin's first win in Xfinity competition at New Hampshire and his second win of the season. Joe Gibbs Racing’s Toyota Camrys are shifting into high gear. JGR's momentum from Kentucky carried over to Friday afternoon's qualifying session at New Hampshire Motor Speedway. 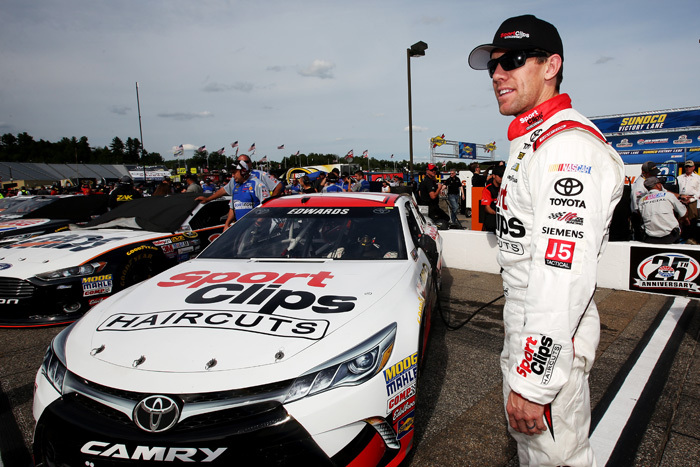 The newest member of JGR, Carl Edwards, won the pole for Sunday's 5 Hour Energy 301 with a speed of 135.164 mph and a fast lap of 28.179 seconds. In addition to Edwards' pole run, all three of his JGR teammates qualified inside the top eight for Sunday's race. Edwards, driving the No. 19 Sport Clips Toyota this weekend, knows how important it is to start up front at New Hampshire. Random thoughts for a Friday about the NASCAR Sprint Cup Series, wondering what the sanctioning body would charge a parched city for a weekend race day, err, days of rain. Having known and heard about Kyle Busch in the last century, and fully aware how successful West Coast drivers had been in Sprint Cup competition, it was easy to secretly root for the young Las Vegas racer. Reigning NASCAR Sprint Cup Series champion Kevin Harvick’s dominating year on the race track earned him the ESPY for ‘Best Driver’ last night at the 23rd annual ESPY Awards show presented by ESPN. 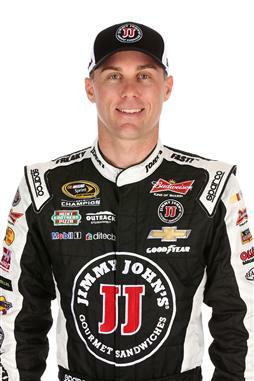 Harvick triumphed over 2015 Indianapolis 500 champion Juan Pablo Montoya, 2014 IndyCar champion Will Power, 2014 Formula One champion Lewis Hamilton and 2014 NHRA champion Erica Enders-Stevens for the win. Last season, Harvick posted five victories, six runner-up finishes and 14 top-five finishes en route to his first NASCAR Sprint Cup Series title, clinched in walk-off fashion in the season finale at Homestead-Miami Speedway. Harvick also set six track qualifying records and earned a series-best eight poles. NASCAR slapped a new set of rules, reducing downforce, on the cars for Saturday night's Quaker State 400 in Kentucky, and it looked like the 1.5-mile track had been coated with that old "bear grease" used at Darlington in the 1970s. Kyle Busch's Toyota was fastest. What a surprise. He's adept at hanging loose. Before he won, though, he, Joey Logano, Denny Hamlin and Carl Edwards put on an actual duel. Nearly a month ago, Kyle Busch walked away from Michigan International Speedway with a 43rd place finish. His chances of achieving Chase eligibility looked quite grim. Fast forward three weeks and Busch's season has done a complete 180-degree turn. 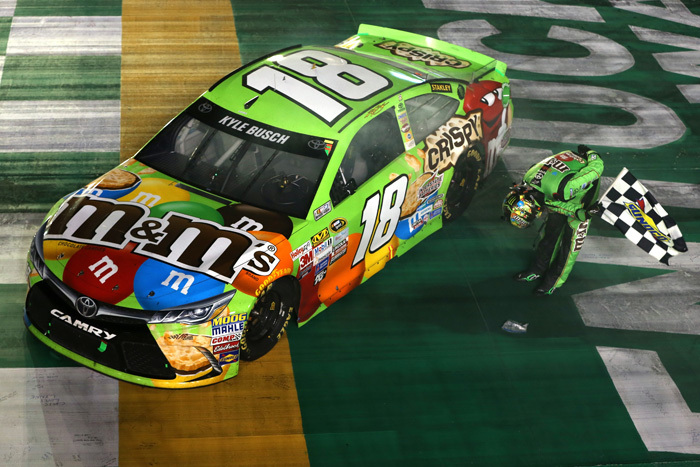 Busch dominated in Saturday night's Quaker State 400 from Kentucky Speedway, leading 163 laps on his way to capturing the checkered flag. Busch now has two victories in just seven races since returning from injuries sustained at Daytona in Xfinity series competition earlier this season. In addition to Busch's now two wins, he also must remain in the top 30 in the points standings to become Chase eligible at the end of the season. If you had to pick a driver to win a race at Kentucky Speedway, Brad Keselowski would probably be the safest bet. 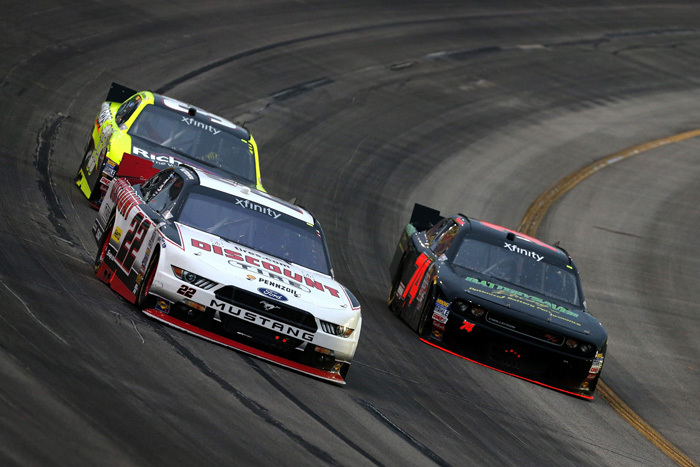 But late in Friday night's Kentucky 300 in the Xfinity series, Keselowski saw himself trailing 19-year old hotshot Erik Jones. But Keselowski was able to use his veteran precision to make the pass when Jones' momentum was halted by the lapped car of David Starr. Keselowski, once again piloting the No. 22 Discount Tire Ford Mustang, held off a final charge from Jones to take the checkered flag. Keselowski, who led 72 laps, admitted he overlooked Jones late because of the lead he and Kyle Busch built on the field, Keselowski believed his fellow Michigan native Erik Jones drove a great race but knew the key to getting back around Jones late was to keep the pressure on the young driver.